[Jakarta, LTTW] People spend their summer holiday in many ways: from visiting festivals or amusement parks with families and friends, to simply staying at home and binge watch on Netflix. 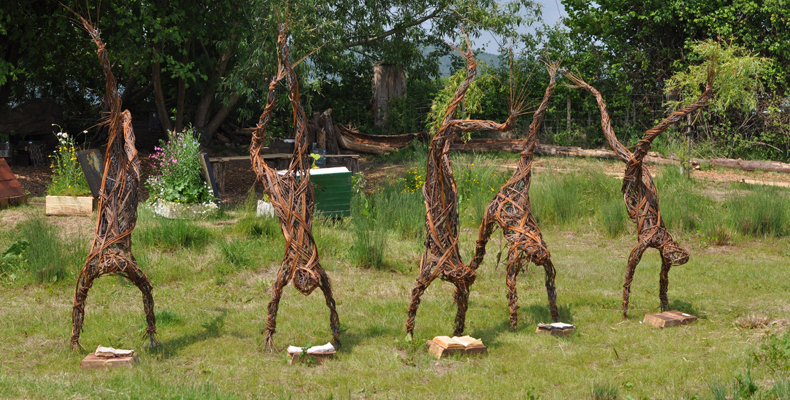 But if you wish to find something that is out of your ordinary way of vacationing, where you are not only able to relax your body, but also to expand your mind, then you should set your next destination to “the village of books” Hay-on-Wye. Hay-on-Wye is a small village that lies on the Welsh side of the Welsh/English border. The town’s name is derived from Norman origin Hay or Haie (a fenced or hedged enclosure) where it stands on the southern side of the River Wye. The village has more than 20 bookshops (mostly secondhand) with a wide array of selection: children’s books, arts, thriller, etc. ; all of which can be yours at a reasonable price. On the streets, you will find shelves full of books kept in the open air for the passerby – sometimes with sofa and chairs next to them. These places are known as “Honesty Bookshop” where, instead of paying the books at the cash register, you put the money in the designated box. In these bookshops, ethic is the currency. The villagers seem to know that providing a unique bookshop alone is not very enriching. So, they created a festival that connects books and people, known as Hay Festival. This festival serves as a space for readers and writers to share stories and ideas. Bill Clinton famously regards this as the “Woodstock of the Mind”. Beside Hay Festival, the village also holds HAYDAYS (sub program of Hay Festival), a literary festival focusing on children and families. A couple of years ago, Hay Festival stepped in to save Hay’s public library when it had to deal with the threat of closure. History shows that, before it was called “the village of books”, Hay-on-Wye was once a ghost town. After World War II, the villagers left their hometown for cities, hoping for a better job and life. But an eccentric man by the name of Richard Booth turned things around, who later claimed himself as The King of Hay-on-Wye. After graduated from Oxford University, Booth decided to revive the village. In the ‘60s, he took a trip to the US and brought back thousands of secondhand books and opened the first bookshop in the village’s old fire station. From there, Booth started to collect more books and rented more buildings to serve as bookshops. The village eventually came back to life and has since become a tourist destination and a retreat for artists, musicians, writers, and intellects. 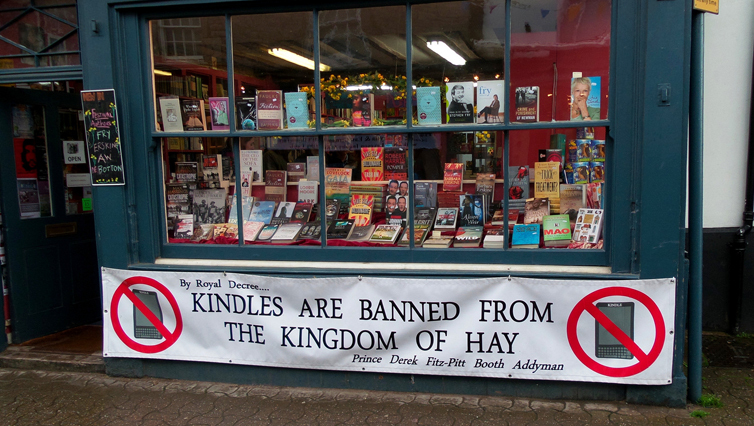 It’s clear that books have become the cultural and economic foundation for Hay-on-Wye; such a perfect example of “good tourism” model where it combines economy, knowledge, and ethics. Perhaps not too many people realize it, but if we look into the first time Richard Booth initiated the book town, we can argue that Hay-on-Wye is not only one of the unseen results of Counter Culture Movement in the 60’s, but also one that continues to thrive. 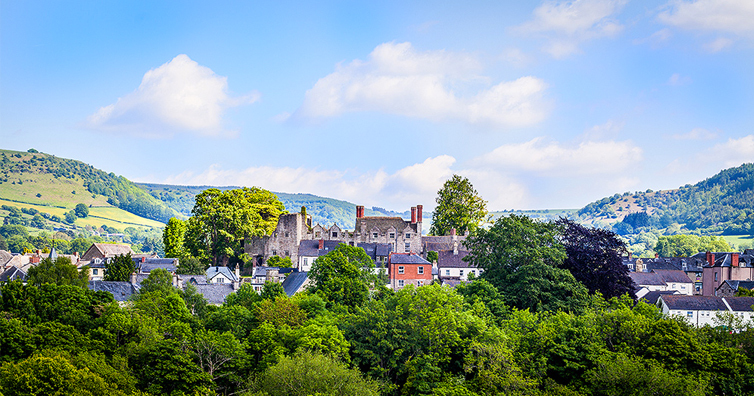 As one of the earliest, Hay-on-Wye is no doubt the beacon of book towns across the world. Maharashtra, Bredevoort, and California’s Gold Cities are among book towns that were directly inspired by Hay-on-Wye. These towns are a very different place compared to the world we live in, where the existence of printed books are getting replaced by the digital version. One of the indications today is children are introduced to digital technology prior to books (and other physical activities). From historical perspective, the reason why human tend to replace and abandon old things is because the old are seen as irrelevant. And many people also believe that “change is the only constant in life”. From the eyes of Sacred Bridge Foundation, however, some things do not (and should not) change. Take books for example. As one of the sources of knowledge, books contain values that are irreplaceable by “digital book”; it sharpens our sensorimotor skill (especially for children). Such value must not be replaced since we won’t be able to comprehend, let alone to develop knowledge without it. Meanwhile, the advantages of digital book in terms of knowledge are secondary compared to the printed one (for example, it’s easy to carry). This explanation is not meant to underestimate digital book; on the contrary it is to make clear that both printed and digital books have their own functions. Rather than to replace and be replaced, it’s better if we find a way to maintain both of them. *Detailed information to get to Hay-on-Wye. Im wondering what requires a city or place to be a book town? It’s more than just selling books right? It’s also more than just a tourist attraction; it’s a culture of the locals i’d say. I would like to visit this place! Can’t imagine what books you would find and people you met at Hay-on-Wye. I agree that book is irreplaceable. Phones or other gadgets can quickly make our eyes tired. Other than that, you cant beat flipping pages, the texture of the pulp, and even the smell of a new book is special.